Moshi Voice-Activated Alarm – I Already Have a Watch. As recently detailed in the New York Times, a new line of advanced voice-activated alarm clocks from Moshi allows the user to set and hear the alarm and time by voice. 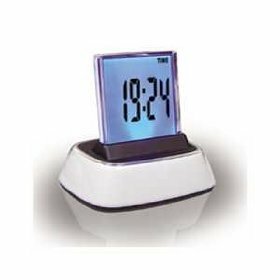 Coupled with a large easy-to-read display, the clocks promise to be especially useful to the visually impaired. The voice recognition technology is also touted to to be superior that that of many competitiors, making use of samples of more than 1,000 voices to aid in recognition. Voice controlled alarm clocks. Technology that listens at Moshi Lifestyle. Tagged with alarm clock, clock, moshi.